Soaps.com covered the annual Day of Days event at Universal Citywalk on Saturday, Nov. 11. Kristyn Burtt had fun interviewing various Days stars about their characters, the new head writer and what’s to come. We produced video footage, which readers can view below, and have a Day of Days 2017 gallery in addition to that. We learned that (spoiler) Eileen Davidson will once again play Kristen DiMera in the latest Days of Our Lives spoiler promo, where there are many surprises in store, including suspense, romance, drama and heartbreak that nobody saw coming. Stephen Nichols and Mary Beth Evans talk about what it was like behind-the-scenes during that crazy Halloween episode, forgiving Tripp, a return for Joey and the new writing regime under Ron Carlivati. Judi Evans (Adrienne/Bonnie) discussed studying to get back into her role as Bonnie, Adrienne’s choice — Lucas vs. Justin — and Evans tells us who in the cast she’d prefer to be stranded with on a desert island. Lucas Adams (Tripp) talked about the trust issues Tripp has, his thoughts on his new family, the trio living in the loft and how Tripp feels about Claire. Marci Miller (Abigail), Billy Flynn (Chad) talked a little about the Halloween episode and Miller took over and discussed how relatable Abby and Chad are to fans, the rocky road coming for the couple and some silly thoughts on who Massey would choose if there were a triangle between him, Miller and Flynn. 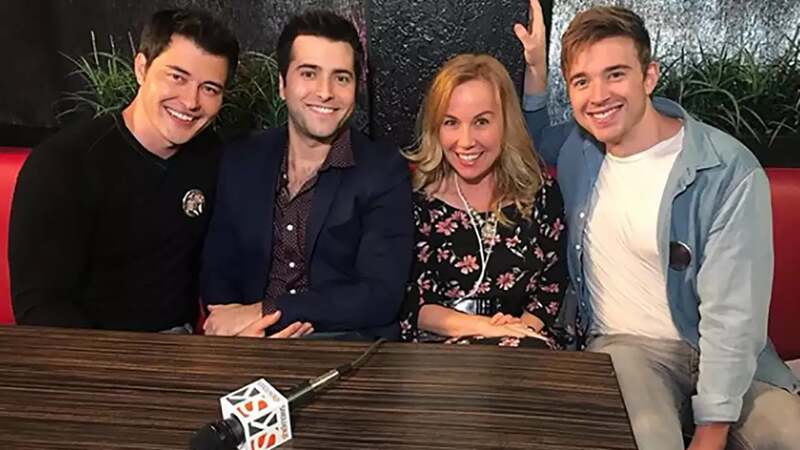 Christopher Sean (Paul), Freddie Smith (Sonny) and Chandler Massey (Will) responded to questions about who Sonny is going to choose — Paul or Will — and each actor wore a button to show their support. Massey shares Will’s state of mind, which will cause issues between him and Sonny. Kassie DePaiva (Eve) talked about Eve marrying Deimos and causing chaos, working at Basic Black, the possibilities of Theresa returning and what it’s been like for her, returning after battling cancer and all the support she received. Eric Martsolf (Brady) discussed Brady vs. Eric and what Brady has been going through and how Brady’s broken and will search for something to fill that pain. Martsolf teased that Eve Donovan coming into the picture is interesting… and how Brady will have to step up his fatherly skills with Tate. Lauren Koslow (Kate) and Thaao Penghlis (André) opened up about getting “into the moment” with regard to their characters and how they allow “the element of surprise” in their scenes. The actors discuss their similarities and differences. Casey Moss (JJ) and Sal Stowers (Lani) talked up the Halloween episode and how Moss had no idea that his girlfriend, True O’Brien was returning as Paige. They recalled how they felt about Lani getting JJ’s job back for him and how once he was back on the job, JJ shot Lani’s brother, Theo. Vanessa Williams (Val) and James Reynolds (Abe) gloat over Abe finally getting a love life and the big upcoming storyline with Abe’s son, Theo, getting shot by the man dating his daughter, Lani, and how that story will affect the entire community of Salem and the families. Nadia Björlin (Chloe) and Bryan Dattilo (Lucas) had fun talking about Lucas’ demons, what it’s like taking his work home and what it’ll take to get Lucas back on the wagon. When asked what will happen between Chloe and Lucas, there were a lot of maybes. They talked about the new head writer and their thoughts on what Ron Carlivati adds to the show. Susan Hayes (Julie) and Bill Hayes (Doug) went back to the beginning of their time on Days of Our Lives with Kristyn Burtt, Soaps.com‘s reporter, and are excited to be really involved in the show, not just go on cruises and be present for Christmas episodes… and how Louise Sorel’s (Vivian) return will rock Salem. There are so many exciting things planned for DOOL, we hardly know which teaser to be the most excited about. Are you ready for all the drama headed to Salem in 2018?